At Buena Veterinary Hospital, our mission is to educate our community and clients through preventative care. We value continued education in both the practice of veterinarian medicine and business operations. If you are passionate about cultivating compassionate patient/owner services, advanced technology in veterinary medicine/surgery, preventative care, are team orientated, and self-motivated to learn, then we would love to hear from you! We are currently hiring for a full-time Veterinary Assistant/RVT Position. Want to be a part of something truly special? We are a growing 3-doctor, AAHA accredited, Fear Free Certified, veterinary practice in Ventura, California and are hiring for *experienced* Veterinary Assistants/RVT’s. This position is an excellent opportunity to be a part of an animal hospital team that truly cares about each other and the clients and pets we care for. At Buena Veterinary Hospital, we are a high-quality veterinary practice that prides itself on outstanding client service and education, as well as exceptional patient care. We strive to exceed the standards of this prestigious organization in every client and patient interaction. We offer a newly renovated facility with new medical equipment and a playful, friendly work environment with a very strong focus on a team approach. As we offer more client education than many veterinary practices do. The veterinary assistant position will require 5+ years of experience with a strong desire to learn about this great field of ours. RVT, CVT, LVT a plus. We are extremely supportive of personal and professional growth. We have high expectations for our staff and hold ourselves accountable for our work and attention to detail and are looking for someone who will understand our high expectations and work to exceed them every day. If you have the minimum experience and the “can do” and “yes!” personality, then this is the right environment for you! The position will be full-time, comprised of 4 days per week, 10-hour shifts with rotating Saturdays as a part of the regular schedule. Experienced Assistants’ pay is based on experience. 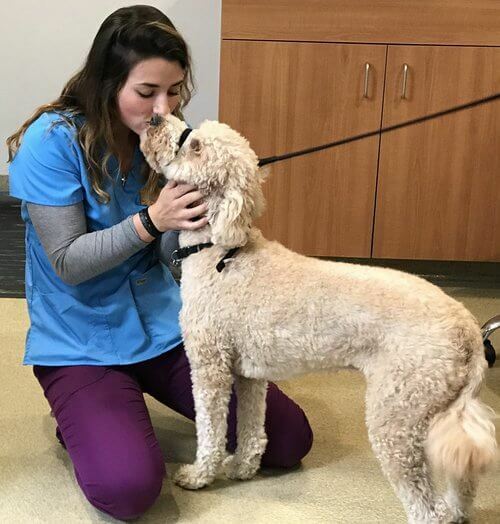 We offer a hiring bonus for RVT’s, and a very generous compensation package (Matching 401K, 1 week paid vacation after 1 year, 4 sets of scrubs, Health Insurance, 7 paid Holidays per year, Continuing Education, and more!) for our full time staff in thanks for their contribution to our practice. To Apply: Please fill out the form below, and submit your resume and cover letter. In your cover letter, please state what position you are applying for and what it is that makes you a “team player,” and list your salary expectations (this will not disqualify you). **PLEASE NOTE**: Although we are very friendly, we are also very busy, so please no phone calls or in-person applications for this position. We recommend pasting a valid link to a PDF version of your resume (example: share link to Google Doc). Or you may copy/paste the body of your resume below.